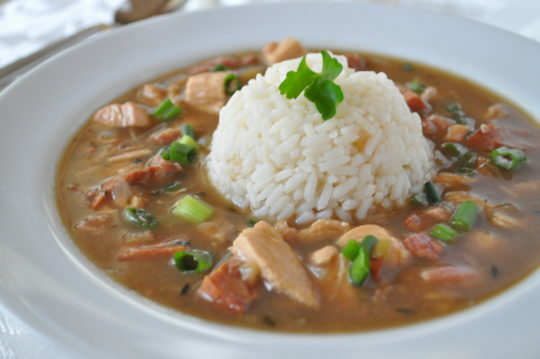 Make my easy Chicken and sausage gumbo wherever you live to enjoy a good Cajun recipe. The browned flour replaces the traditional roux as a thickening and flavor agent. The gumbo freezes well. This recipe is from Holly Clegg's trim&TERRIFIC® Gulf Coast Favorites cookbook. Preheat oven 400ºF. Place flour on baking sheet, bake 20-30 minutes, stirring every 7 minutes, or until the flour is brown (color of pecan shells). This process works well in toaster oven. Set aside. In large, heavy pot coated with nonstick cooking spray, sauté onion, garlic, green peppers, celery until tender. Add browned flour (the roux), stirring constantly. Gradually add water, tomatoes, chicken, thyme, cayenne pepper. Bring to boil, lower heat, and simmer 45 minutes to 1 hour, or until chicken is tender. Quick Tip: When thickening stews and soups with flour, prevent lumps by mixing the flour thoroughly in a cold liquid before adding it to the boiling mixture. To prevent a starchy flavor, heat the thickened liquid to boiling. Recipe from Holly Clegg’s trim&TERRIFIC® Gulf Coast Favorites. For more of Holly's easy, healthy recipes, visit her Blog and YouTube channel.